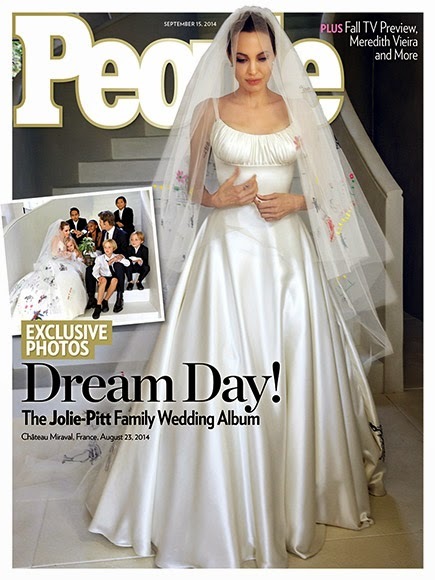 Lush Fab Glam Inspired Lifestyle For The Modern Woman: Snapshot: Angelina Jolie And Brad Pitt's Wedding! Snapshot: Angelina Jolie And Brad Pitt's Wedding! We are gushing over the newly released first photos of Hollywood's most beautiful couple, actors Angelina Jolie and Brad Pitt on their wedding day. From their intimate ceremony to Angelina's elegant dress and it's symbolic design that placed love and family at the forefront of their big day! Read on for more photos and details. After years of tabloid headlines and media speculation Angelina Jolie and Brad Pitt finally tied the knot in a beautiful and intimate ceremony with only 20 guests at their private French chateau on August 23, 2014. Angelina looked classy and elegant in a scoop neck, ivory gown with a fitted bodice and flare skirt designed by Donatella Versace for the Versace Atelier line. Drawings by Brad and Angie's 6 children were sewn onto the back of the gown and veil by close family friend tailor Luigi Massif turning her gorgeous wedding dress into a heart felt masterpiece! What do you think of Angie's dress? Share with us by leaving a comment below.